In our first six years, we have invested over $715,000 in 39 partner organizations, who have reported back that JWFA is collectively and incredibly providing a more safe, healthy, and equitable future full of possibility both directly and indirectly to over 500,000 women and girls. By investing in Jewish Women’s Fund of Atlanta, you help create a more equitable world that expands opportunities for Jewish women and girls. Our success lies in an innovative and empowering model of philanthropy. No other organization is as exclusively and passionately dedicated to the advancement of Jewish women and girls in Atlanta and around the world. Donations of any amount are meaningful and important. Please consider investing today. Donations of any amount will further the mission of Jewish Women’s Fund of Atlanta to increase our impact in the lives of Jewish women and girls. Donate online by clicking here, or mail your contributions to: Jewish Women’s Fund of Atlanta, 1440 Spring Street NW, Atlanta, GA 30309. We also accept gifts of appreciated securities, recommendation of grants from philanthropic donor-advised funds, and private foundation or corporate gifts. You can also support JWFA by donating advertising or marketing space. Please contact us for more information. Let someone special know you care, while making a difference in the lives of Jewish women and girls. An investment of at least $18 per person can be made in honor of a specific individual. The honoree will receive a tribute card in the mail, notifying him or her of your donation in their name to Jewish Women’s Fund of Atlanta. Please donate online or contact us to make arrangements. Perfect for Chanukah! An investment of at least $3,000 per year for three years (or $1,000 per year for three years for women under age 45) affords you the ability to help decide where the Jewish Women’s Fund of Atlanta dollars will go. By becoming a JWFA Trustee, you will have the opportunity to take an active role in the decision-making process while effecting social change for Jewish women and girls. 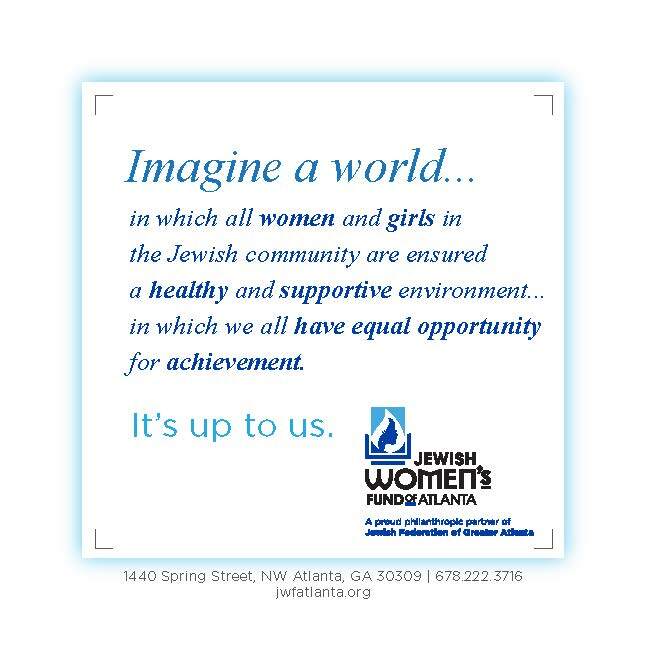 A planned gift is a lasting investment in the work of the Jewish Women’s Fund of Atlanta. Please remember Jewish Women’s Fund of Atlanta in your will, trust, retirement account, or life insurance policy. Please contact Rachel Wasserman at rwasserman@jwfatlanta.org or 678-222-3716 for more information about including JWFA in your estate plans or donating today. Click here to visit our Legacy Society. On January 19, 2018 we honored our three founders, Carol Cooper, Ilene Engel, and Sara Franco, while also celebrating our first five years of work. This community event was a wonderful opportunity to learn more about Jewish Women’s Fund of Atlanta and our mission of social change. Please click here for more information.